Last weekend my wife and I took a much needed vacation and decided on a cruise leaving the port of Miami. We live in Sarasota FL on the Gulf coast, and to get to the Port of Miami, you need to cross the state, so we took to "Alligator Alley" Which is much like it sounds, a mostly straight section of highway cut straight through the everglades running across the state. There is nothing out there other than a few "recreational areas" (read: Pull off area with a picnic table) and the Miccosukee service plaza, which is a few restrooms, a nice deli and a gas station. This is also where the Big 3 does some of their final shake down testing apparently. The parking lot was full of blue and white Michigan plates all stating they were MFG plates. New Chevy trucks, a few dodge vehicles, and the crowning jewel the yet to be released Corvette Stingray. My take? The car looks fantastic in the flesh, Photos do not do it justice, (especially mine apparently taken with a toaster) but i do not think it will age well. It is a drastic departure from the c5 and even the c6. I think here and now it looks excellent, but in a few years time, who knows. 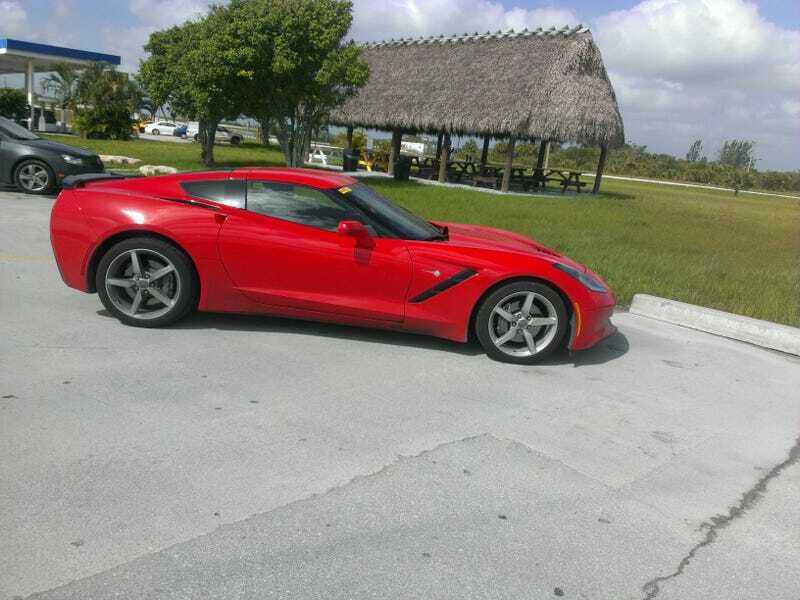 It is audacious and over the top, but thats what a corvette is supposed to be. I am still not a fan of the Squircle lights, but they are growing on me.